Good news, indeed. It can be frustrating when you know exactly which wine you want, only to find it's not available locally (as was my friends' problem, described above). I live in somewhat of a wine wasteland (small town with not very sophisticated tastes) and usually stock up when I cross state lines and hit the big city. The shipment arrived last night, several days ahead of schedule. I opened a bottle of Spatlese, and it was as good as I remember, though the memories that came back were even better. The process from start to finish was simple, as they have a PayPal account. If you are a wine enthusiast, I highly recommend Weingut Eduard Kroth in Briedel, Germany. They ship to Texas, which is a rarity, so I think they ship to most states. I knew Bartho's father well, as I'd visit the winery at least every six weeks my last 3 years in Germany. The winery was about a 10-15 minute drive from my apartment in Traben-Trarbach. We just hung out and shot the bull for 2-3 hours at a time. I recall how he loved to talk about cars, and he really liked my Volvo 242 GT. He educated me during every visit, while going through a typical wine tasting. He started with Kabinett, followed by Spatlese, Auslese, and depending on time, Beerenauslese and Trockenbeerenauslese. Every now and then, he'd open a bottle of Eiswein from his personal stock. It wasn't for sale, as he typed the labels himself. As to my first purchase, I bought a case consisting of six Spatlese and six Auslese, all were silver or gold medal winners. The recent strength of the dollar vs the Euro reduced my cost further. Including shipping, I paid less than $200 for the case. Judging by prices I've seen for similar vintages, I paid about 40% of retail. My wife didn't...but she hasn't tasted it yet. She's always liked Rieslings, as I found out on our first date nearly 35 years ago. I took her to a restaurant I had taken other "first dates" to, and they had a "special wine list" that you had to ask for. On that list were several Mosel wines, giving me the opportunity to talk about the town of origin, and what it was like to live in Germany. It was a great icebreaker. Great memories, NHN, and thanks for the tip about ordering from the winery. As expected, my wife didn't buy the "Euro play" meme...lol. However, she didn't seem too upset over my purchase of an 18 bottle, dual zone wine cooler. It's able to handle up to a dozen of the elongated bottles that are more prevalent these days. I think it was reasonably priced, $200 +/-. If/when we move to another house, I think I'll look for a built-in model. Llano Estacado winery just received a big endorsement from a surprising source: my wife. They stopped on the return home from El Paso for a nephew's graduation. I was glad to stay home and supervise a son who had to study for tests this week. She bought 3 bottles...she never does that! lol Seriously, if you're ever traveling through Lubbock, a trip to Llano Estacado will be well worth your time. I recall they had three levels of wine tasting, and I found their "free" level to be quite good. Next time, I'll try their $20 level for "educational purposes." On an unrelated note, I can happily confirm that a good Riesling Spatlese pairs perfectly with spicy chile. We're having a chili cookoff at work today, and my batch had a nice kick to it. Opened up a bottle of a 2013 Spatlese that I bought from the German winery, and it cooled down my mouth immediately. My recipe was simple: two pounds of veal, large can of tomato puree, large can of diced tomatoes, a large jar of Hatch chili, one can of black beans, one red onion diced, and assorted spices...maybe I should have avoided the teaspoon of cayenne, that might have been overkill. Next batch will likely have two cans of black beans, but there's a few people I work with that prefer chili without beans. I also added a bottle of Hofbrau Original. The idea of Texas wines is intriguing, not that I'll have the chance (or reason) to visit the Lonestar State anytime soon. One of these days Mr. M and I should visit a local winery. I suspect the offerings will be sweeter than we like, but no harm in tasting. We bought a bottle of local wine when we visited Gettysburg (can't remember the variety) and it was just okay. We passed a few wineries in eastern Ohio on our way to visit relatives north of Canton a few days ago; perhaps we'll give 'em a try. According to the AT Wineries interactive map at www.atwineries.com, there are 15 wineries in West Virginia. I find that extremely intriguing. Which raises the question, could the state transition from a coal economy to a wine and tourism type economy? I look at how Lost Oak Winery has grown over the 3 years we've been wine club members. They've added facilities to handle events such as weddings and birthdays, and they're currently unable to meet the demand for their wine, i.e. they bring in grapes from elsewhere, such as Lubbock/Texas High Plains AVA. I don't know the percentage of growth in their staff, but I see new faces along with the old during every visit. Their bimonthly wine club pickup now takes place over two weekends due to the growth they've experienced. The Texas wine industry has exploded, yet their production has yet to sate local demand. Hopefully in 2017, they'll be exporting more. I doubt CA, OR, & WA gives us a thought, but that's ok with us. DENVER (AP) -- State officials say an insect that attacks grapes has been found in Colorado's largest wine producing area. The state agriculture department said Wednesday that federal officials had confirmed the presence of phylloxera (Fa-LOX'-ah-rah) in Mesa County's Grand Valley wine region, home to nearly 75 percent of Colorado's grape acreage. The department says it and Colorado State University are investigating the source of the aphid-like bug and working with the vineyard owner to eradicate it. They're also working to determine the extent of the infestation. The insect is native to the eastern and southeastern United States. It has spread to many wine regions around the world and devastated vineyards in Europe in the 19th century. According to the state, this is the first time it's been detected in a commercial vineyard in Colorado. This is a situation that needs to be watched closely. Not a recent article, but interesting nonetheless. IMO, it bodes very well for other wine states, such as Oregon, Washington, and Texas. Interesting. Seeing a definite expansion of Vineyards in this area at least by my drive by noticing of them. I learn something new every day. The Nampa/Twin Falls area looks like a great area to visit. Of course, I'd also add Coeur d'Alene to my route, owing to its closeness to Spokane, where I went to college. Looks like a great area for wine (Nampa), south of the 45th parallel. Grapes for wine are found between 50-70 degrees latitude. By comparison, the Mittelmosel area is at 50 degrees latitude. Calgary is at 51 degrees, and I located a few wineries in Alberta. There is apparently room for further growth in the industry. I believe Texas has advanced to the 6th largest state, and last year's production was barely enough to satisfy local demand. The dominance California has in terms of production is simply staggering, over 80% of US production. 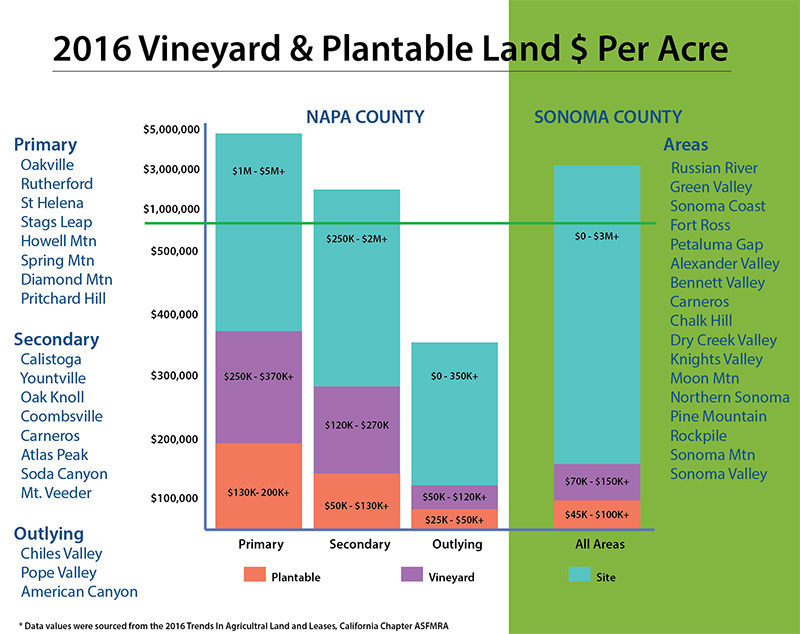 The increasing land cost in California is obviously sending investors/growers to other states. My palate is not sophisticated enough to notice the difference between a $150 Napa cabernet and a $25 cabernet from my favorite winery. The most important lesson I've learned about wine is, if you like it, it's good wine. Jeff's a self-styled expert on "cheap" wine, with a targeted price of under $12. I'm looking forward to his "2017 Hall of Fame" to be announced in about ten days. If you come now bring your skis. Thanks for the link. I'm all about "cheap" I bought a bottle of Woodworks cabernet sauvignon so I could make BBQ sauce out of it and that felt like a splurge. It was good though it was almost as good as a French Bordeaux I picked up for comparisons purposes. @musiclady Liebfraumilch? You came to the right place. Get thyself to your local liquor store and ask for a bottle of Mosel Spatlese. Pronounced "shpAt-layze", it's a German term loosely translated as "late harvest". German wine terms are primarily designations as to the amount of sugar in the grape when harvested. In a wine class I took a few years ago, I asked several presenters as to why Mosel Riesling hasn't made a bigger splash in the US. Americans, particularly women, enjoy sweeter types of wine, and German Riesling is world class. They all responded, "German wine is too difficult to explain". I chuckled, as I had four years living along the Mosel. Ok, back to business. You won't have to spend $30+ a bottle for quality Spatlese. Ask for a Piesporter Michelsberg Spatlese. Piesport is the town, Michelsberg is the vineyard. 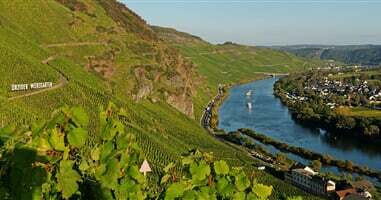 Michelsberg gets a bad rap, I call it the Walmart of Mosel vineyards, as its slopes are not very steep. As a result, it doesn't have the panache of an Urziger Wurzgarten, where the grapes are grown at slopes in excess of 60 degrees. You should be able to buy a bottle for 8-10 dollars. A higher quality auslese, more of a dessert wine, can be had for $15. Urzig wine normally goes for more than double. BTW, this was the view that greeted me on my drive home from work my last two years in Germany. German wine standards are very exacting, and higher quality wines will have an official approval number on the label. It may look something like this: A.P. NR. 2 606 319 011 07. I've been getting a bit more confident in recommending Riesling to restaurants that don't have it on their wine list. For example, one restaurant/sports bar offered chardonnay and cabernet, yet they had some spicy dishes, such as an excellent venison chili. Riesling is a perfect pairing, as the acidity balances out the spiciness of the dish. I offered my suggestion that they add a Riesling for their spicy dishes, and the fact that most women prefer a sweeter wine. I can speak from experience. A couple of weeks ago, I made veal chili at home that included "medium" Hatch chiles. It had a nice kick to it! I opened a bottle of Spatlese and it cooled the fire almost immediately. It also pairs nicely with Chipotle seasoned black bean burgers that we get from Costco. Jeff's an interesting fellow, and an expert at "cheap wines". He now teaches the Wine and Viticulture Course at El Centro CC in downtown Dallas. I took the class from a teacher who retired at the end of the semester. Best $150 I ever spent. His website is an excellent resource, https://www.winecurmudgeon.com/, and I strongly recommend it. I love his annual "$10 Hall of Fame." Wow! Thanks for all that incredibly valuable information! It's particularly good to know that Riesling mitigates the spiciness of foods. My entire family likes to go to restaurants where the food is a bit spicy for me (Indian, Thai, Mexican), so now I know for sure that Riesling is the wine to buy. I do like cabernet and chardonnay, but Riesling is best for my palate. All my kids like beer, and I've tasted some fruity beers I really liked, but my staple is a good white wine. Thanks for the tip on Spatlese. I've been to Germany twice, years and years ago (and to the Frankfurt airport many times since) and really loved seeing your photos. I would like to report that I am drinking a substandard wine---Apothic Dark. It was a gift from a friend, and I sort of forgot I had it. I opened it tonight...the aftertaste is just...bad. But hey, it's free! And I love the bottle. I found a recent review here: http://www.honestwinereviews.com/2014/01/apothic-dark-wine-review.html. Some of the comments were a hoot! The only thing that matters about wine is, do you like it? I'm flattered that you would move my thread to the top echelon of the BR Tavern. I better get off the schneid and post new material. I think we need to get off the schneid and start drinking more wine, @Night Hides Not ! Page created in 1.739 seconds with 21 queries.